Over the last few years, classrooms have evolved to accommodate project based learning opportunities in the area of STEAM - science, technology, engineering, arts, and math. As a result, there is a growing trend of toys and gadgets that aim to engage kids in educational play by introducing them to STEAM concepts. One such gadget is the 3D Magic ImagiPen. 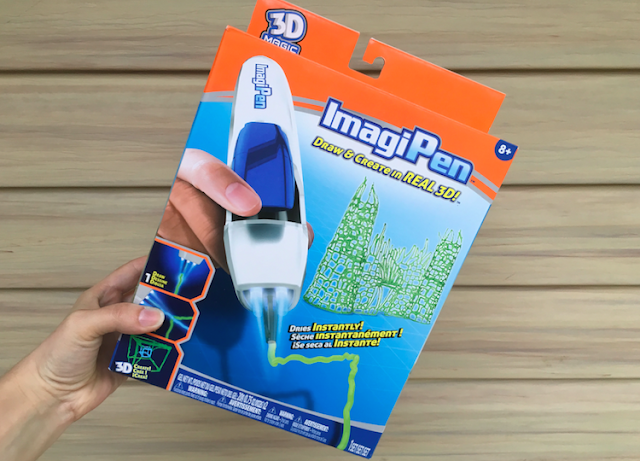 The ImagiPen allows kids to create 3D drawings by using a special no-heat pen that has a built-in UV light, which allows kids to build creations in mid-air. 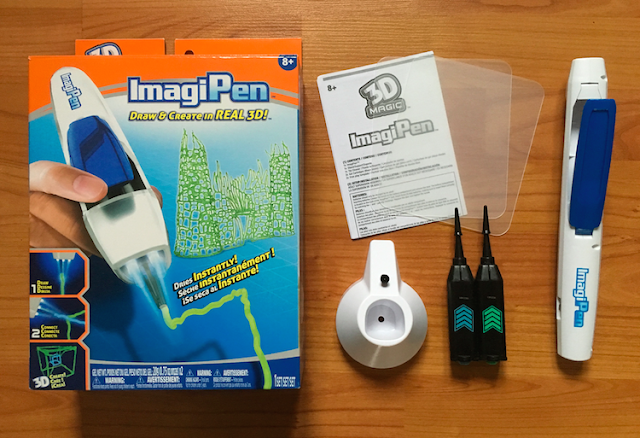 The kit includes an ImagiPen, one blue gel cartridge, one green gel cartridge, an ImagiPen docking station, a cleaning tool, and two free-play stencils. Batteries are not included. For our first project, my daughter and I decided to recreate the Eiffel Tower. Using a template we found online, we traced the designs by placing the free-play stencils on top of the template and tracing it. We placed the stencils on the window sill to cure for a couple of hours and once we had all the pieces we needed, we began to assemble our Eiffel Tower. It took us a while to get the hang of using the 3D ImagiPen, especially since my daughter, who loves to draw, would use it like a ball-point pen. When creating flat pieces of art, you need to let the gel fall into place and be wary that it will remain wet for a while. We had to redo some of the pieces and even still, they weren't perfect. As such, some parts were difficult to stick together during assembly since not all the edges were perfectly straight. We simply considered this a lesson in engineering and design! For the very top of the tower, we used the ImagiPen with the UV light setting so it dried in mid-air. It was a little too tall but the neat part is that, once it has cured, you can trim it with a pair of scissors. 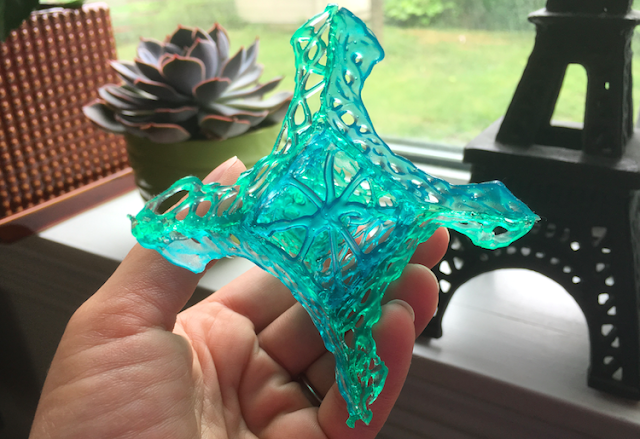 What you want to keep in mind is, when creating flat pieces, it can get a little messy if you accidentally touch the design while it's wet. 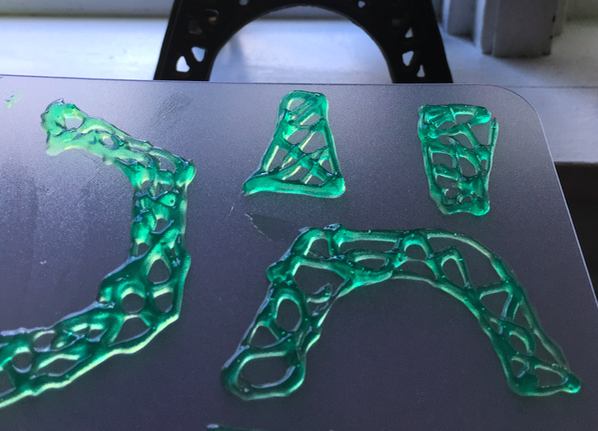 The gel ended up on our hands more often than I cared for which is why I prefer using the ImagiPen to create vertical designs with the UV light on so it dries instantly before I can get my clumsy fingers all messy. 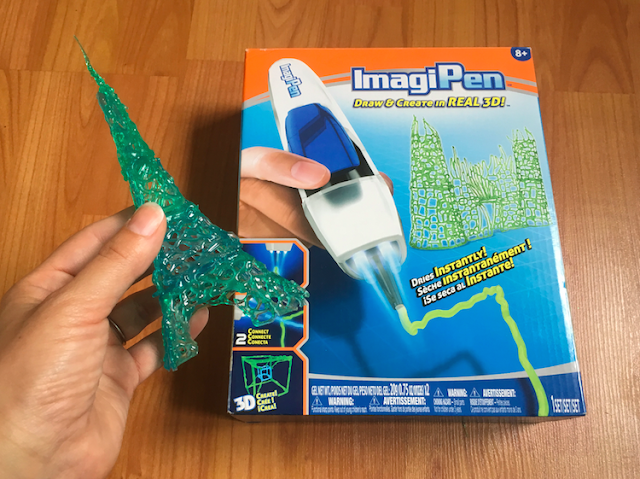 The 3D Magic ImagiPen, designed for kids age 8 and up, is available online at imagipen.ca for $29.99 plus $8.99 for shipping and handling. I've also seen the ImagiPen on Toysrus.ca for the same price but you can save on shipping by selecting the free in-store pickup option. Disclosure: I received a product sample to facilitate this review. Any opinions expressed in this post are my own. My kids love all things Stem and would adore this product. In fact i think it would be great for Beakerhead too! My boys would LOVE this!!! So cool!!! I haven't seen this product before. Would you recommend it for a school Makerspace? Sounds a little messy to me and may require too much direct supervision for many kids.